With the parody that is Malaysian politics coming to your friendly social media channels in the near future, it is hard to ignore that elections are coming up. I had an interesting chat with a few Malaysians here in Auckland after a night of whiskey and loud music with a lot of middle aged Filipino ladies and Caucasian men crowding the dance floor. Don’t ask me how or why but that was where we had our farewell for two close friends before they left for Malaysia the next day. We were having supper and Bryan brought up the topic about elections and how he wouldn’t be voting for it. He also thought that Malaysians abroad should not be allowed to vote. It just so happened that I was contemplating on whether I should vote or not. When he brought this up I urged him to further explain his statement. What an interesting perspective. It never occurred to me that there would be a possibility that something so drastic could happen if the current government is toppled. Truly, will it bring more good then bad if there was change and how do we know this? How can we make sure a better Malaysia emerges without having total chaos and anarchy reigning over our heads for years to come. I wouldn’t want Malaysia to be another Burma. However, it does beg the question of, if Malaysians back home are fighting for change are we not as compatriots responsible to help them? Regardless of the fact that we do not work nor live in the country anymore. 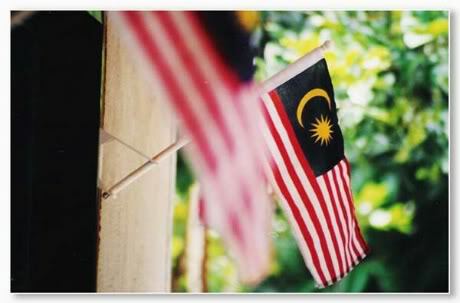 I have lived overseas for almost 10 years but for the life of me I cannot let go of Malaysia. You can take the girl out of the kampung but you cannot take the kampung out of the girl. I come from a Chinese family BUT my extended family is sino-kadazan (now known as kadazan dusun murut) and so my upbringing has been the best of both worlds and public holidays. I have family members who are bumis and I can tell you now the grass is definitely not greener on their side. I see both sides suffering and I can see where democracy has failed. Money that should have gone to the people of Malaysia go into the pockets of those who need it least, trust in public figures and the police force is nil. With all this mind how can I not vote in the coming elections. With the coming of change, even with the threat of violence is it not better to try then to not try at all. If my fellow Malaysians are fighting for change should I stand by and watch or jump into the foray? Most importantly, is it not as much my battle as it is theirs? if u know ur vote will bring the change that you and the slim majority want, then pls exercise ur vote.. the outcome of the votes is simply the voice of the majority… whether chaos or not is just a reaction to the outcome n hopefully malaysians are civic-minded about this, otherwise whats the point of a democratic system? tats just it.. we don’t really know the result of the vote and tats y its important to have free fair elections so tat at the end of the day, we know one thing… what is the ppl’s choice as a whole? but how do you know my vote will bring a change? chaos is not something to look upon. Each person wields a heavy responsibility when we vote. Unfortunately alot of us abuse this right. Indeed your question is very valid, what IS the point of a democratic system in Malaysia. Thanks for the input and love your blog especially the DIY section! My vote for this coming election is going to be my first time voting. Before coming of age, I said to myself that even when I’m 21 and entitle to vote, I will never going to vote. If my family (father is a MCA member& supporter, mother side relatives are UMNO-BN members&supporter) drag me to the voting vanue pun, I will ruin the vote. Biar rosak undi. But then my mom say to me: if you tidak undi, you tidak ada hak untuk complain the wakil rakyat when he/she do not do the right job. If you kasi rosak undi, berbaloikah you baris berjam2, berpanas hujan untuk rosak undi sahaja? You may not be an army, a police, a navy or a public servant. But this is your chance to show your patriotism and contribute to your country by taking your right to select a better leader for our people and country. My mom have some points there, so I will definitely do my part to go and vote. And there was this controversy about postal vote i don’t remember when already and where I read the article. Konon2, there will be some people within the government to vote for those Malaysian that live out of Malaysia and entitle to vote but didn’t bother to. It might be some conspiracy theory tapi who knows kan.
Hey NB, I think Malaysians overseas can now vote online if I’m not mistaken have to check and your mother is a very wise woman. i remember my boss said if you have 5 eligible voters in your family, 3 undi the gov, 2 undi the other party. He said seriously with his serious face and voice. I thought he was joking, which I still am thinking if he was joking or being serious, and I laugh. How could we possibly do that? My parents and one of my brother vote in papar because that is their hometown in their IC. My other brother and I vote in kk but different voting venue. So seriously, can the plan work? Mau kasi gegar tapi mcm tidak boleh jadi. wakakakakaka! I think a vote is needed… without it, things wouldn’t change. I mean, if we don’t vote, we are almost sure that the current situation will be the same or worse and it seems to me, the people are getting upset day by day. If we do vote (for the opposition), at least there is a chance for a change in our country’s system. Maybe it will get worse but it may get even better. It’s a risk worth taking. It’s a pity that my trust in the opposition is as bad as my trust in the current government.